Bollywood stars take to Twitter to bring attention to the plight of elephant 'Number 44'. Mumbai: She left the audience scared with her recent box-office hit horror film Pari, but what left Anushka Sharma horrified is the heartbreaking image of an elephant, known only as "Number 44," being beaten up violently by numerous men. This elephant is used for carrying tourists at Amer Fort in Jaipur. The tweet was posted by the actor immediately after PETA India's Associate Director of Celebrity and Public Relations, Sachin Bangera, highlighted the plight of elephant no. 44. Recently actor Sonakshi Sinha had fired off a letter calling on Rajasthan Minister for Forest, Environment, Youth Affairs and Sports Gajendra Singh Khimsar to relocate this elephant to a rehabilitation facility for urgent care. The letter followed PETA India's complaint to the Chief Wildlife Warden of the Rajasthan Forest Department, which resulted in a show-cause notice issued to Number 44's custodian, Wasid Khan, holding him responsible for the abuse. The notice stated that an investigation carried out by the Regional Forest Officer for Jaipur Zoo, as well as a photograph supplied by an American witness, indicated that the elephant was treated cruelly, in apparent violation of numerous animal-protection laws. 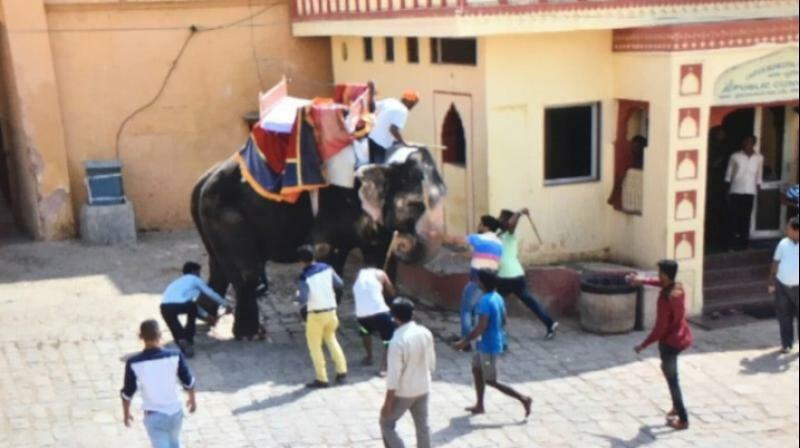 The Jaipur police also registered a First Information Report against unidentified men under Sections 429 and 289 of the Indian Penal Code for mistreating the elephant and putting public safety at risk. However, Khan was later allowed to use her for rides.